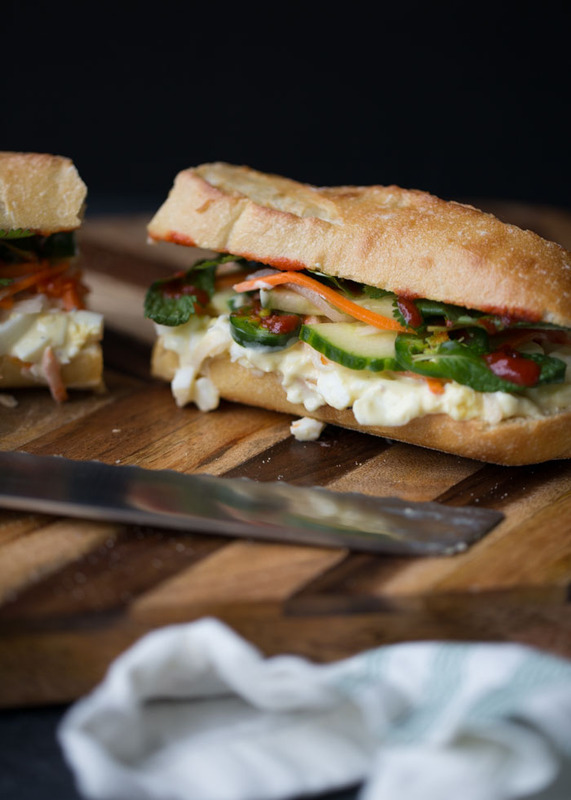 “Banh Mi,” literally translated, is – to my limited knowledge – the Vietnamese word for “bread.” So anything goes, right? 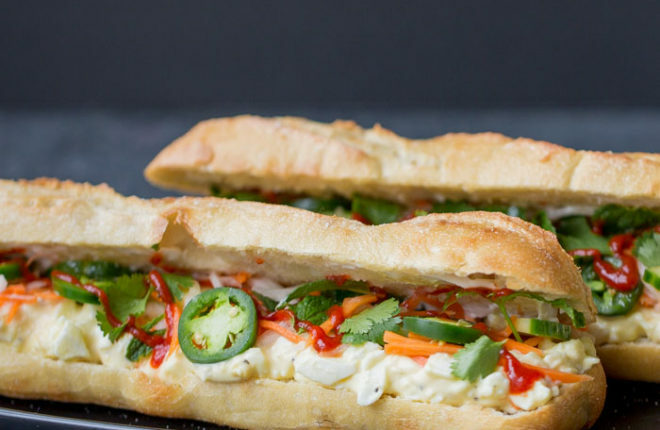 Basically, I’m trying to justify the fact that this is, I’m pretty sure, about as inauthentic as a banh mi can be. 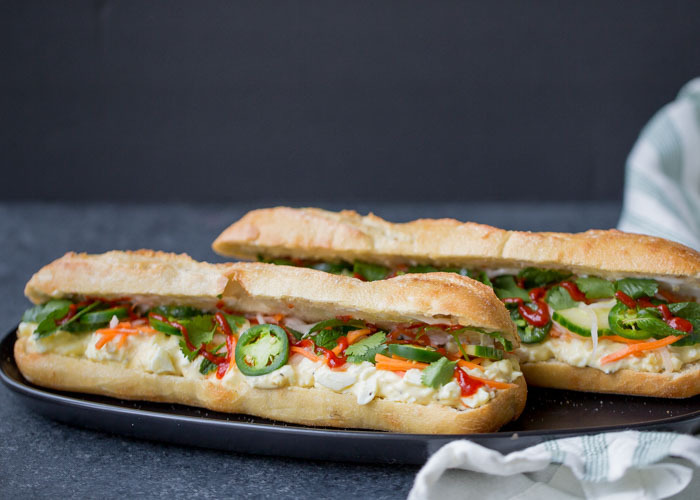 It’s inspired by the oh-so delicious Vietnamese sandwich that’s typically made with meat (or sometimes tofu), meat pâté, pickled veggies, jalapeños, and fresh herbs all piled on a perfectly chewy-yet-soft-inside-yet-crunchy-outside baguette. But instead of meat or tofu, this one’s stuffed with egg salad. Obvious choice, right? Here’s how I came up with the idea. Our local Vietnamese restaurant has delicious banh mi sandwiches. I get mine with tofu, my guy gets his with chicken or pork. But they also top every sandwich with a fried egg. Which sort of threw me for a loop at first, but then, I dug it. A lot. 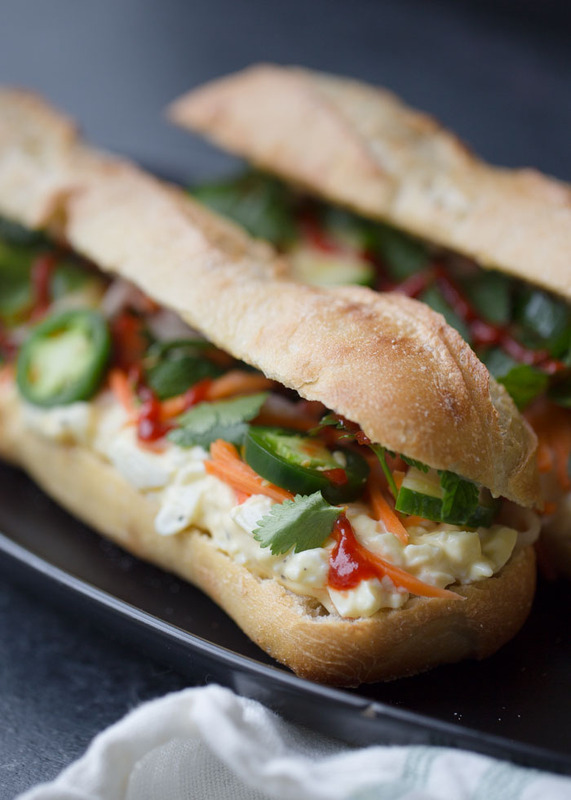 So when it came time for me to finally try my hand at banh mi at home, something in me was screaming “Egg! Egg!” And then I came to the egg salad place and thought, hmm, that just might work and then we tried it all topped with Sriracha and it was glorious and the end. … and then loaded up with fresh herbs in true banh-mi fashion. And THEN drizzled with Sriracha sauce because hello, Sriracha sauce. 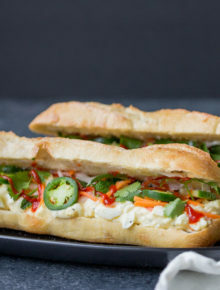 Basically, this is the best egg salad sandwich I’ve ever had. Possibly the messiest, but also the best. Oh, and one nice thing about this one is that you can prep the veggies and make the egg salad ahead of time. So then all you have left to do is slice the bread, toast it if you want, and assemble. And, of course, eat! Make the marinated veggies. 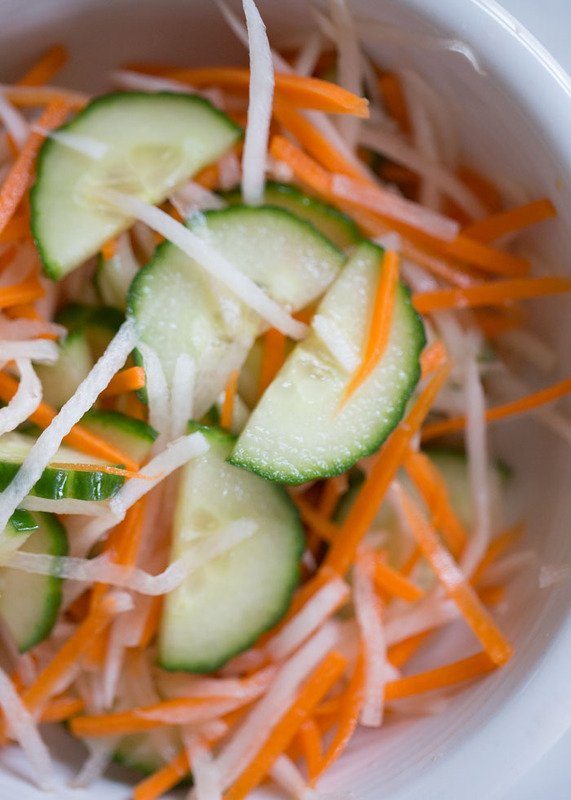 Place carrots, daikon radish, cucumbers, vinegar, agave nectar, and salt in a medium bowl. Toss well. Set aside and let sit for 10-30 minutes. While the veggies sit, make the egg salad. In a small bowl, mix the chopped eggs, mayo, salt, and pepper. Taste and add more salt and pepper if desired. Half the bread, keeping one side attached. Toast if desired. Place bread under the broiler until pale golden and a bit crusty (mine takes about 1 minute). Remove from oven. Or, if you’re doing a take-and-bake baguette situation, hurry and bake ’em on up! Close the sandwich (the best you can) and slice in half. Serve immediately. Makes 4 (5-inch) sandwiches. To make ahead of time, refrigerate the marinated veggies, slice the jalapeños and prep your herbs, and make up your egg salad. Then just assemble when it’s time to eat!